Chunithm Arcade Machine is a music video game by Sega which uses touch and motion sensor controls to play, allowing players to hit notes faster and more frequently! The game, created by the Mai Mai developer team, uses a new control panel that referred to as "air strings" or the "Ground Slider". It is a keyboard like panel that is split up into 2-8 parts for control and is a touch sensor. So simply tap the corresponding section of the ground slider to what is indicated on the screen to hit the note. The game also uses motion sensors to the left and right of the cabinet, which allows player to get hand motions involved in the game as well. The cabinet is of smaller height, using glass panels around the screens to insulate sound for those outside and to amplify it for players. The cabinet features woofer speakers and a 32" display, as well as bright LED lighting, which is used quite heavily in the cabinet to attract and entertain players and onlookers. 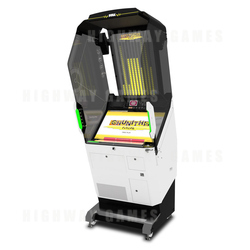 The machine allows players to use headphones; the cabinet sound comes from a multi-channel speaker system; and players can be helped out by characters during the game, each of which has their own specific capabilities.